Craftastical! 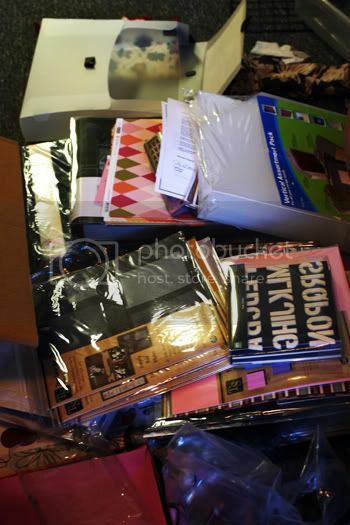 : So, that's what $1000 worth of scrapbook supplies looks like! So, that's what $1000 worth of scrapbook supplies looks like! Wow, I am just overwhelmed. My boxes from scrapbook.com arrived. HOLY MOLY! I could not believe how packed they were. It's crazy! I waited all day yesterday for UPS, then right after I left for class (David says it was like 30 seconds), they arrived! I called David on the road to tell him I cut someone off (never done that before, it was strange and I felt bad and needed to tell someone) and he said that it had come. Grr, right when I have to wait another two hours. Well, my class is cancelled (that's a whole other story, I will get to later), so I raced home, called Melissa and then tore into the boxes. Let me tell you that the pictures don't do it any justice. Seriously doesn't look that impressive in the photos, but when it's piled all around you--WOWZA! I don't know how I'm going to use it all. I shared some with Melissa and I'll share some with my mom and also donate some to a Primary activity and the rest will somehow be absorbed into my stash. Somehow. Right now, it's all in a box in my office/scraproom/Griffin's crib room. I keep having to walk around it. Not so convient. Especially in the middle of the night when Griff woke up. So, here are some photos. 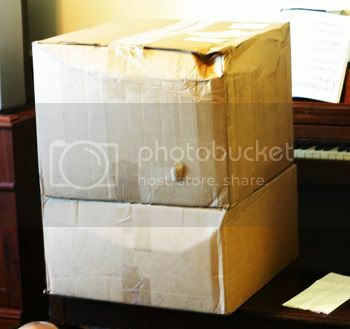 The boxes sitting on my piano bench. 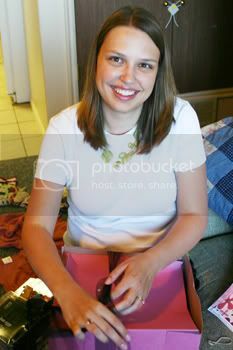 The Heidi Swapp stuff in an adorable pink cakebox! Some SEI stuff. Very cute! Putting it in piles as I looked through it. And here's a image they sent out in the newletter annoucing the winners, shows all of the stuff. So, about school. My typography class was over last Friday. I was signed up for an Adobe Illustrator class, the only other Art and Visual Communications credit offered this summer that I haven't already taken or don't need. Well, went to class yesterday. There wasn't any room number or instructor on the computer. So we called UVSC to ask about it. They didn't know anything, but said the room number was 535. Well, it wasn't. That's someone's office. No one was there (the class was from 5:30-7:10) and there were 7 of us there, trying to figure out what was going on. Well, you have to have at least 12 students to go forward with the class and with only 7 of us, they probably cancelled it and didn't notify us. So, not only can I not take that class, but I'm left to find another non-AVC class to take or I won't get fincial aid or credit for last semester and I've already missed two days. I blow raspberries at UVSC. I envy your prize, but I can't really covit because I know you totally deserve this! :) Have fun with the new supplies, I hope to see lots of new pages with them soon... also good luck with the class, I hate when that happens!